The Diva's Weekly Challenge #240: Birthday Leaves! Spring or autumn, leaves bring colour, life and play to our gardens. Many tangles are based around nature and I think leaf shapes automatically brings the sense of relaxation. Silver Birches are my favourite trees, I love the shade in summer, the colour in autumn, the sun shining through the branches in winter and the new life in spring. Oh wow. They're both lovely. Your lines are so clean. A lovely exploration of Autumn. I love your Renaissance Zendala. I can never get my white to show up like that. The zendala is lovely - ordered yet whimsical! 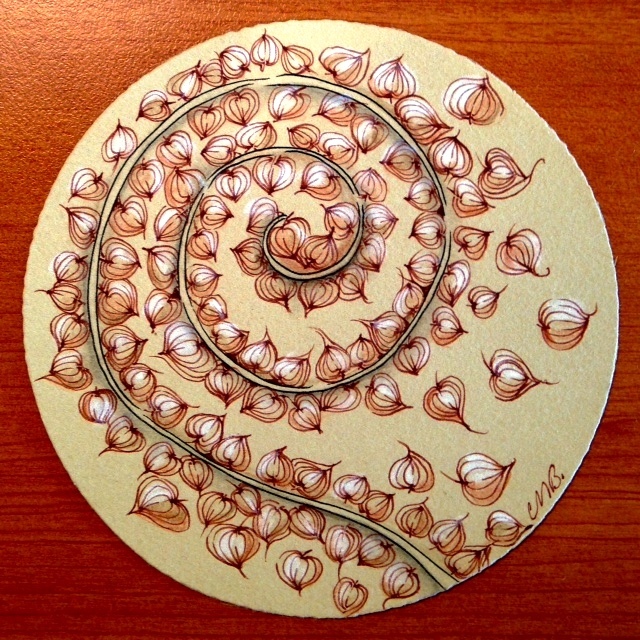 Lovely work, I adore your wonderful organic shapes and beautiful swirling leaves. Thanks for sharing your inspiration garden spot. 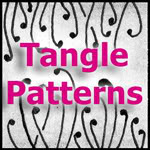 This challenge is perfect for your beautiful tangles. Both are very lovely and also very different and special. 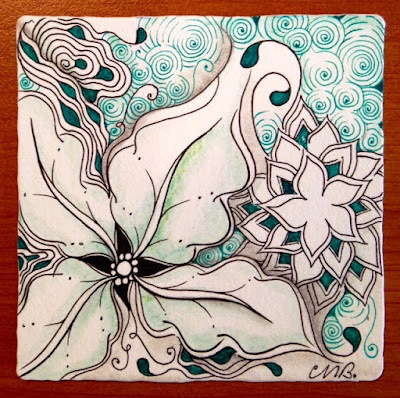 Lovely spiral design for your first tangle, and the second tile is simply inspiring. I love birch trees too. Sadly, they won't grow here so I thank you for sharing such a pretty sight! In addition to liking the spiral piece, I also admire the discipline it must have taken to maintain concentration to do all those lovely little leaves. (I find myself rushing to finish if I'm not too careful.) You have given us both autumn and spring at once with your two very different pieces. Lovely. 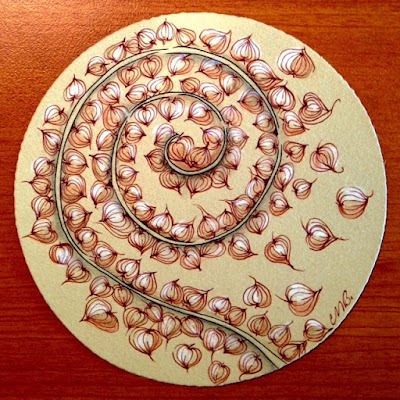 Your spiral is beautiful with all of its detailed leaves. Very nice! Woe, so beautiful and original ... I love them both. You are a lucky person with that beautiful spot in your garden!!!! 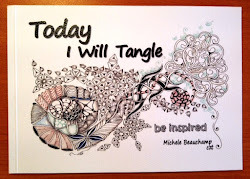 Every time I see your work I add to the list of tangles I'd like to work on with you next year. Wow, really love your first tile! Beautiful composition and colours. So creative and so beautiful. Gorgeous! a treat to behold. Love the spiral with all the...well, I think they look like Chinese Lanterns :) but I'm sure there's a name for that pattern...at any rate, it's so full of energy and very gardeny. Delightful stuff here! Love your peaceful garden spot. Great tiles too! Beautiful composition on the zendala tile with the Renaissance colors. The birch inspired tile is also lovely. I like the touch of turquoise.